VETOED by Governor Martinez on 3/1/18. SB 51 did not progress to a full House floor vote because HB 64 had already passed the legislature. SB 51/HB 64 will place a modest fee of $100/year on pet food manufacturers that register each product of dog and cat food and treats sold in New Mexico (added to the current $2 registration fee), phased in over a period of three years: $50 in 2019, $75 in 2020, and $100 in 2021. It does not apply to—and will not have any impact on—the cost of livestock feed. The bill exempts small businesses (with annual gross revenue of $3 million or less) and prescription diets. Funding from the fee will pay costs of providing low-cost spay/neuter for animals of income-qualified New Mexicans in areas most in need, and 4% will go to NM Department of Agriculture to fund pet food registration enforcement, and up to 5% of remaining fee revenues may be used by NM Board of Veterinary Medicine for enforcement of the Animal Sheltering Act. The bill includes a 6-year sunset clause so the State Legislature can assess the effectiveness of the fee increase. A similar bill passed the House in 2017 by a bipartisan 50-17 vote but did not advance through the Senate. *Based on documented costs of animal control, care, and euthanasia in NM and intake/euthanasia reduction data from another state that recently raised pet food registration fees to fund spay/neuter, Animal Protection Voters estimates that local government animal control and shelters will see a recurring cost-savings of approximately $500,000/year. Why do we need to fund spay/neuter? New Mexico’s local governments and non-profits spend $38.5 million in tax and donor dollars to fund animal care, control and spay/neuter services—a number that has increased over time. Over 135,000 dogs and cats enter New Mexico’s animal shelters every year—about half are euthanized. Rural counties have the greatest need: Euthanasia rates are as high as 60%-85%. 2/3 of New Mexico counties have inadequate spay/neuter services. The pet food manufacturer fee increase proposed by SB 51/HB 64 is the best and only remaining feasible funding mechanism appropriate for New Mexico that is not already enacted. What about other existing funding mechanisms? The NM Legislature has already created a spay-neuter license plate and a voluntary tax check-off program, but they have not generated nearly enough income for a comprehensive, statewide, subsidized spay/neuter program. How are statewide spay/neuter funds administered in New Mexico? Beginning July 2018, funds will be administered by the NM Board of Veterinary Medicine, which will hear and approve a newly-created animal sheltering subcommittee’s recommendations for spay/neuter fund distributions. 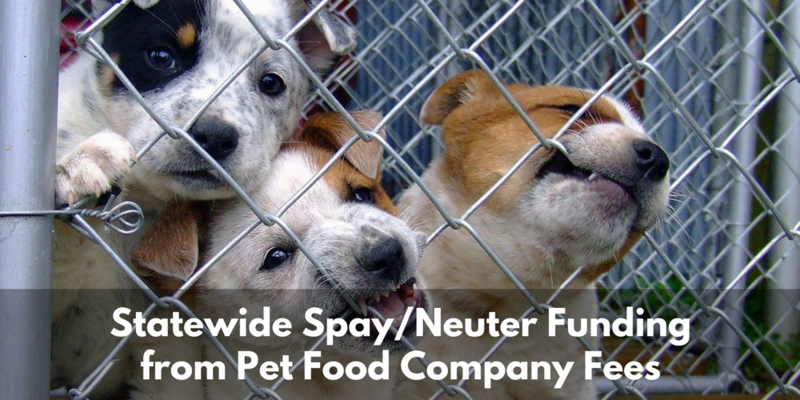 How much funding would the additional fee provide for low-cost spay/neuter? The fee is expected to generate an estimated $1.37 million per year, with more than $1.2 million annually dedicated to sterilize an estimated 16,000-22,000 dogs and cats of income-qualified New Mexicans every year. This approach is PROVEN to be effective to reduce shelter pet euthanasia. Other states—West Virginia, Maine, and Maryland—have increased or added fees for spay/neuter onto existing pet food registration fees. Notably, Maryland passed legislation in 2013 raising pet food registration fees to $100 over the course of three years and reports a slight decrease in intake and dramatic 29% reduction in euthanasia. Many other states charge pet food manufacturers $50 to $100 per product for sale in those states. New Mexico currently charges only $2/year per product. We are missing out. SB 51/HB 64 would bring our pet food registration fees in line with what other states charge, but dedicate that money to covering costs of low-cost spay/neuter services. If pet food manufacturers pass the fee to consumers by proportionally raising retail prices, it will average only $0.69 to $1.38 per year per dog/cat (as it phases in). MYTH: Consumers will not be able to afford pet food and will be forced to give up their animals when the manufacturers pass down the cost of the additional $100 fee. FACT: Based on data and testimonials from other states, there is NO evidence that adding a $100/product fee will be a burden on consumers or cause consumers to relinquish their animals. The corporations that sell most pet food in the U.S. are million & billion-dollar companies that can easily absorb the additional fee, in the same way they absorb the costs of doing business in other states already charging them more. But if every company passed the additional fee down to customers with a proportional increase in dog and cat food prices, New Mexicans would see an average increase (based on updated data from the NM Department of Agriculture) of only approximately $2.46/year per pet-owning household1 to feed their pets, or $1.38/year per dog/cat1 on average. If an increased fee spurred animal relinquishment, Maryland animal shelters would have seen an increase in dog and cat intake. However, over the course of three years since implementation of an increased pet food registration fee, dog and cat intake numbers decreased slightly. In a comparative analysis between New Mexico, neighboring states, and other states that have increased pet food registration fees to pay for spay/neuter services—we’ve found that pet food retail prices are unrelated to the types and amounts manufacturer fees paid, and some pet foods sold in the same stores are more expensive here in New Mexico than in other states that charge manufacturer fees for spay/neuter. MYTH: We cannot predict the impact of this fee increase in New Mexico. FACT: The best available data from states who have implemented similar pet food registration fee increases shows undeniable effectiveness in reducing the costs of pet overpopulation, as well as a zero to negligible impact on consumer costs, retail pet food prices, and availability of a variety of products in those states. Since enacting a pet food manufacturer increase in Maine, the state reports a decrease in euthanasia. Maine has also since seen an increase in the number of pet food/treat products registered for sale. Notably, Maryland passed legislation in 2013 raising pet food registration fees to $100 over the course of three years and reports a slight decrease in intake and dramatic 29% reduction in euthanasia. Testimonials received from Maine and Maryland pet food retailers report no negative impact on sales. MYTH: The increased fee will give an unfair advantage to Internet sales over in-state brick-and-mortar retailers, thereby harming in-state pet food stores. FACT: According to the NM Department of Agriculture, the fee is assessed per manufacturer per product sold in New Mexico, regardless of whether the products are sold in brick-and-mortar establishments or via online sellers. The NM Department of Agriculture already administers the current $2/year per product registration fee, and this applies to manufacturers regardless of whether products are sold online or in-state. The spay/neuter program fee mirrors this fee scheme. MYTH: There is a better way to fund low-cost spay/neuter services. FACT: An independent New Mexico study conducted at the request of a Senate Memorial determined the most effective, feasible, and equitable funding mechanism was a fee increase for pet food manufacturers. MYTH: The additional fee will harm the pet food industry and cause manufacturers to stop selling in NM. FACT: Based on data and testimonials from other states, there is NO evidence the additional fee will harm the extremely profitable global pet food industry. The U.S. pet food market had a value of $24.60 billion in 2016 and is forecasted to reach $30.01 billion by 2022.2 The pet food industry’s sales have continued to increase nationwide, even after three states have enacted fees to fund spay/neuter. Pet food companies sold an estimated $190 million worth of food in New Mexico in 2017, almost double the sales of the previous year. The number of products sold in NM increased from approximately 8,300 in 2016 to approximately 13,700 in 2017. In general, the wealthiest pet food corporations produce the largest number of products registered in New Mexico, which means the increased fee amounts will primarily be proportional to higher volume of sales and greater ability to absorb the cost. There is NO evidence that pet food companies have stopped selling in states due to increased/added fees in any way that has meaningfully impacted consumers. During the time that Maine has implemented increased fees to fund spay neuter, the number of different pet food products sold in Maine has increased significantly (as provided by testimony from Maine retail pet stores). Contact your State Legislators and ask them to vote YES on SB 51 & HB 64 to provide statewide spay/neuter funding!